Throwing various items at bad performers is a thing. Or rather, it used to be. Thankfully mankind is more, well, civilized in this day and age. Unless you’re the poor duo trying to put on a show in The Rainsdowne Players: Opening Night, as here, you’ll have to dodge all kinds of objects from a disgruntled crowd. Everything from bottles to paper planes will be sent your way, adding to the already challenging aspect of entertaining random strangers. The definition of ‘tough crowd’, really. But while that may sound a tad negative, it does create an interesting – and slightly challenging – rhythmic affair. Actor on the left dodges by moving left, while the one on the right has to make a quick body transfer in the opposite direction to avoid taking a hit. A simple enough setup, and early on, equally simple in terms of execution. Ain’t long before basic bottles, which are easily dodged, are joined by paper planes and even tomatoes, though, at which point you’ll have to pay attention to not just which side it originates from, but also where it lands. Tricky business, theatrics. 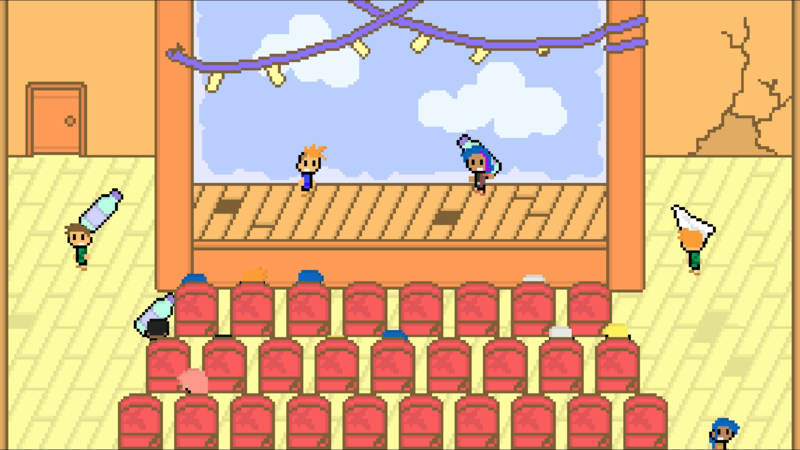 Between each play, you’ll be able to strike a chat with members of the audience (whoever decided to actually stick around, anyway), hopefully acquiring feedback. See, after the initial performance, you’ll be able to mix things up, changing just what our lovely duo acts out, as it were. Subject, location, purpose and other things can be modified, alternatives opening up as you acquire more ‘inspiration’ from conversations, as well as examining various items. Who knows what idea might pop into your head by staring at a wall that looks like it’ll break if even slightly poked, after all? Who indeed. All that said, The Rainsdowne Players: Opening Night came to be as a free introduction of sorts for the upcoming full version. Exactly what we can look forward to in terms of additions… well, I haven’t the foggiest! Steve O’Gorman – its creator – hasn’t been spilling the beans, and mind-reading ain’t my strongest suit. We’ll just have to wait and see. In the meantime, why not take the game for a spin? Dodge left! Right! Left! Left! Right! Left! And… curtain!